I’m so very blessed in the area of friendships. I have friends that giggle with me, listen to me silently, teach me daily, and some that push me to do things. I have a blogger friend that challenges me to blog better, one that gives hugs that are right up there at the top in my books, one that listens while I talk and objectively gives her opinion, one that ever so sweetly listens to my more often than not negative mindset at times, and one that connects daily with me via email so our relationship stays strong. Most all of my friends are women these days, but there are a few men I hold quite valuable to my life. They have taught me a thing or two about endurance, to get a stiff upper lip, and to have a strong backbone when needed. My collection of friends, each one more different than the other, brings joy to my life. And to be honest, most of those relationships came from me stepping into the unknown. Last evening one of my friends and I shared an experience that neither of us had ever done before. It included few people either of us knew, and it involved being somewhat creative. It also involved me being outside my comfort zone. We attended a Women in Ag event where all the attendees paint the same picture. The daunting task of choosing colors for my portrait and then actually getting rid of my straight line and even sides attitude took a bit. But having that friend there on my left made it easier. Even the strangers on the right made it awesome! 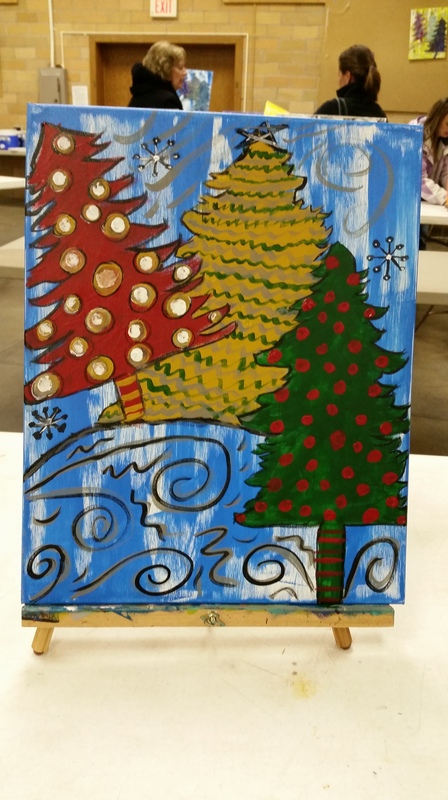 My masterpiece in all it’s glory with it’s non-perfect trees, crazy lines, and the “wind” at the top! Sometimes when I put the tip of my toe on the unknown I end up dancing into happiness. Don’t let the unknown hold you back, grab a friend, and ever so slowly put your toe, then your whole foot, then your whole body into that place that eventually becomes LIFE. Next Parenting 26 years & this is a new one for me. Love this post!!! And your painting turned out beautiful! Great job! !